One inspired William Hill punter landed a large amount from a £ 0,50 fifteen legs accumulator across last Saturday afternoon’s football. Just try to imagine how this punter might felt when he saw Christian Eriksen came off the bench to strike a stoppage-time winner for Tottenham against Burnley last Saturday. The electronic board on Wembley was showing four minutes of injury time and that was the time when that man, Christian Eriksen, sensed his moment had come. The late goal of Dutchman didn’t just lead the “Spurs” to a 1-0 victory, but also gave to our fellow bettor a very large pre-Christmas bonus. Actually, it was not the only match that he got really lucky. For example, Reith Rovers were losing to Dumbarton 1-2 before they score a late equalizer at the 88th minute and got their winning goal just a minute later. 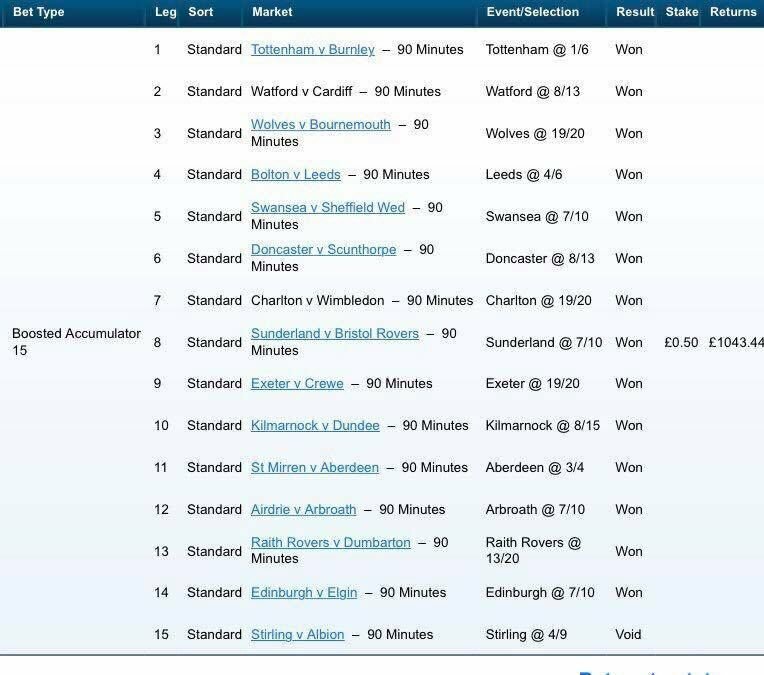 He just put a £ 0,50 to a fifteen-legs accumulator at William Hill. As we can see from the bet slip he just backed all favourite and just hope that no underdog would go in his way. Eventually, it didn’t. Αnd so he won £1.043,55. Not bad for a Saturday afternoon.